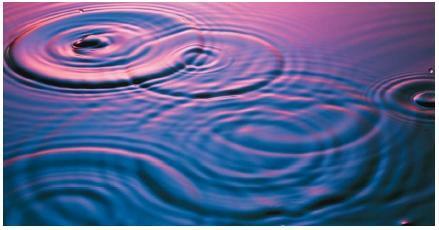 Interference is the interaction of two or more waves. Wave motion is a common phenomenon in everyday life. Light and sound, for example, are transmitted by waves. In addition, waves can often be seen on lakes, ponds, and other bodies of water. All waves have high points, called crests, and low points, called troughs (pronounced trawfs). Suppose that two or more waves are generated at the same time, as shown in the accompanying photograph. Here, water waves are spreading out from the point where pebbles have been dropped into a pond. You can see how the waves overlap each other at various points on the surface of the water. This overlapping effect is interference. In general, waves can interfere with each other in one of two ways: constructively or destructively. When the crests of two waves and the troughs of two waves arrive at a given spot at the same time, their effects are added to each other. The result is constructive interference. When the crest of one wave and the trough of a second wave arrive at the same time, their effects cancel each other out. The result is destructive interference. Interference of sound waves. Constructive and destructive interference can be detected by the intensity of the result. For example, suppose that two sound waves interfere with each other constructively. In that case, the sound is louder than is the case for either wave individually. If the two sound waves interfere destructively, the sound is more quiet than with either wave individually. Interference of light waves. Interference of light waves has been studied for many years. It was first described in 1801 by English physician and physicist (one who studies the science of matter and energy) Thomas Young (1773–1829). Young found that light waves can be made to interfere in such a way as to produce bright and dark bands called fringes. Interference also accounts for the range of colors (called a rainbow or spectrum) sometimes produced by reflected light. When white light from the Sun reflects off a thin film of oil, interference may occur. Light of some colors is reflected off the top of the film. Light of other colors is reflected off the bottom of the film. The two sets of reflected light interfere with each other either constructively or destructively. Constructive interference results in the production of bright colors of different shades. Destructive interference produces dark bands with no color. the exhaust system. The muffler then produces another sound wave that is out of phase with the exhaust sound. The two waves interfere destructively, canceling the noise that would otherwise be produced by the exhaust system. The oil film phenomenon described earlier is used for filtering light. Precise coatings on optical lenses in binoculars or cameras, astronaut's visors, or even sun glasses cause destructive interference that eliminates certain unwanted colors or stray reflections. If two light waves are caused to overlap destructively, what happens to conservation of energy? I mean what if you set up an experiment that splits a monochromatic beam of light into two each having the same amount of energy using a special mirror. The two beams can be shifted apart by half a wavelength by having them travel different distances. When they recombine at another special mirror, they should interfere entirely resulting in darkness. What happened to the energy carried by the waves? Is it gone? Hmmm. What would you say the most important applications of this theory are? is the phenomenon of coherence possible by a single ray of beam...?